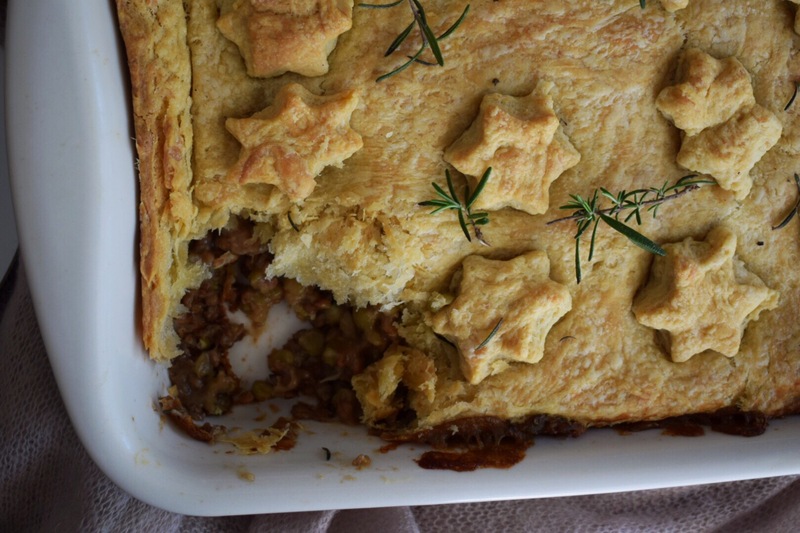 My mother needed an excuse to make puff pastry, and as my head is already set in the ‘Winter Dishes’ mood, I decided that a cosy pot pie was in order. With only 3 months left before I depart for the University of Pennsylvania, my mother is desperately trying to gauge my culinary knowledge before she’s left alone in the kitchen. So this weekend she came up with a proposition: for me to teach her how to make puff pastry. Alors, we spent all of Sunday afternoon rolling and making pastry turns until our arms got tired. But hey, it yielded this wonderfully flaky pastry, didn’t she do a good job? My brother is a huge fan of pot pies. Whenever we go out for dinner, that is his go-to order unless there are ribs on the menu of course. As a vegetarian, I couldn’t grant his wish for sticky barbecue ribs but I was able to deliver with these steaming flavourful pot pies. For a fancy dinner-party worthy dish, these are incredibly easy to prepare. 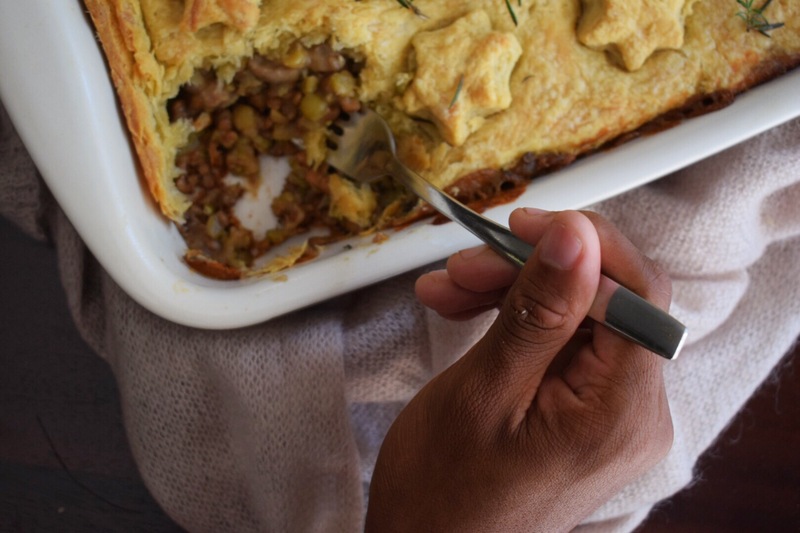 As we in Zimbabwe are preparing for winter, I’ll be whipping up a big batch of puff pastry with my mother just so we can have these pies as and when we please! Preheat your oven to 180°C/350°F. Heat a large cast iron pot on high and fry the onions until translucent, about 2 minutes. Add the mushrooms, garlic and carrots and cook until the vegetables are tender and the garlic is fragrant, stirring occasionally to prevent the garlic from burning, for 5-7 minutes. Season with salt and pepper. Add another splash of vegetable oil with the flour and toss until the vegetables are coated in flour and you have a thick paste, as if you’re making a roux for Bechamel sauce. Pour the vegetable stock into the pot and stir to dissolve the flour in the stock. Once dissolved, add the lentils and split green peas and stir to distribute. Add the oregano, cinnamon, thyme and some S&P to taste. Bring the mixture to a boil before reducing the heat to low. 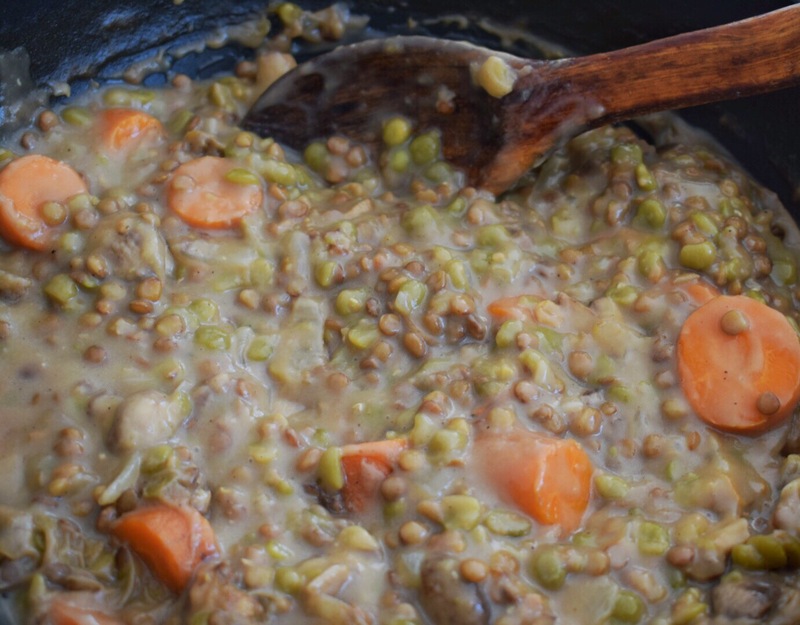 Simmer for 15-20 minutes or until the lentils and peas are soft and cooked through. You’re going to want to watch the pot very carefully here as the mixture will thicken considerably and will burn if left for too long. If the mixture seems very thick and the pulses haven’t cooked as yet, add a cup of water to the pot. Season with salt and pepper to taste. Grease a 9×13 dish (bear in mind the pastry will only cover the top of the dish if you use this) or an 8 inch pie dish (will cover bottom and top) or 4 different 5 inch pie dishes (will cover top and bottom). Roll the puff pastry out to the desired size then trim to fit your chosen vessel. 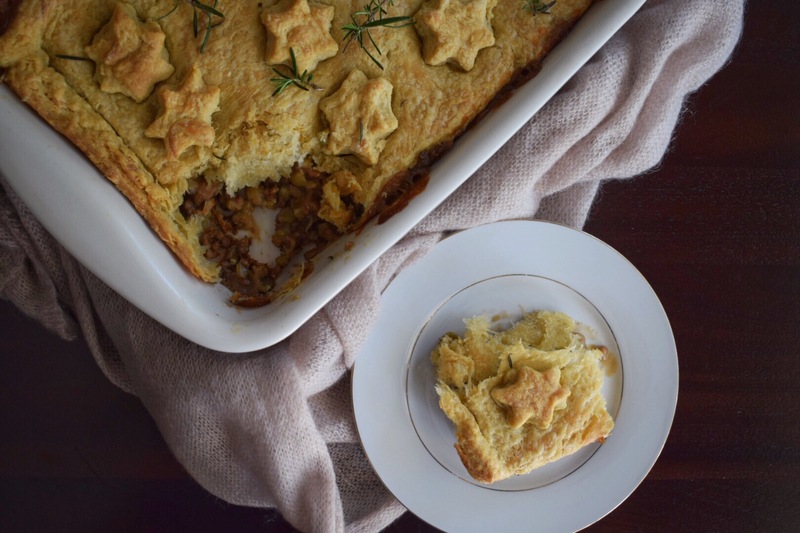 If not using the 9×13 dish, the fit the puff pastry in the bottom and sides of the dish. Once the filling has cooked distribute it evenly amongst the serving plates. Cover with the remaining puff pastry. 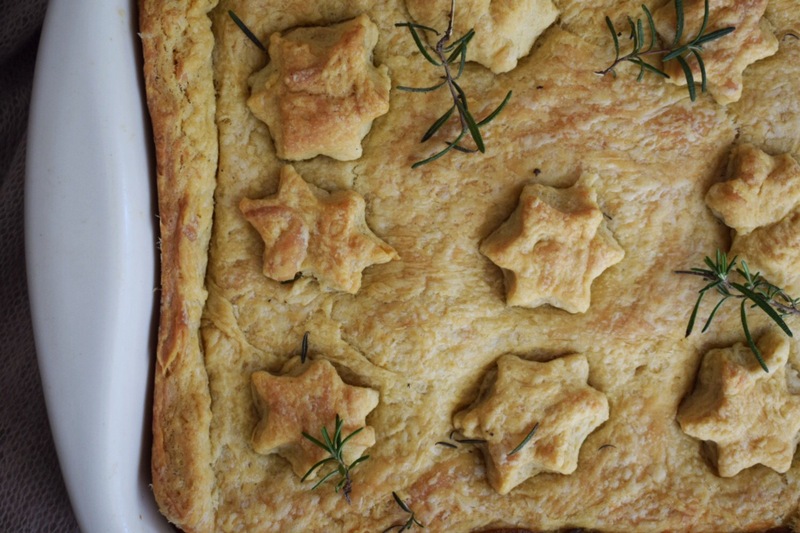 If you have scrap puff pastry, you can use a cookie cutter to cut shapes into it and use it as a topping like what I did with these stars. Bake in the preheated oven for 37-40 minutes or until the pastry is deep golden brown. Let rest for 5 minutes at room temperature before serving. Leftovers will keep sealed tightly in the fridge for up to 3 days. Enjoy!